What's in my Fridge? I'll show you mine if you show me yours! I'm a nosey sort. I love when magazines show you what celebrities have in their fridges. They probably email across a list, a very edited list and then it's shot all bonnie, with everything carefully arranged, but I still love it. 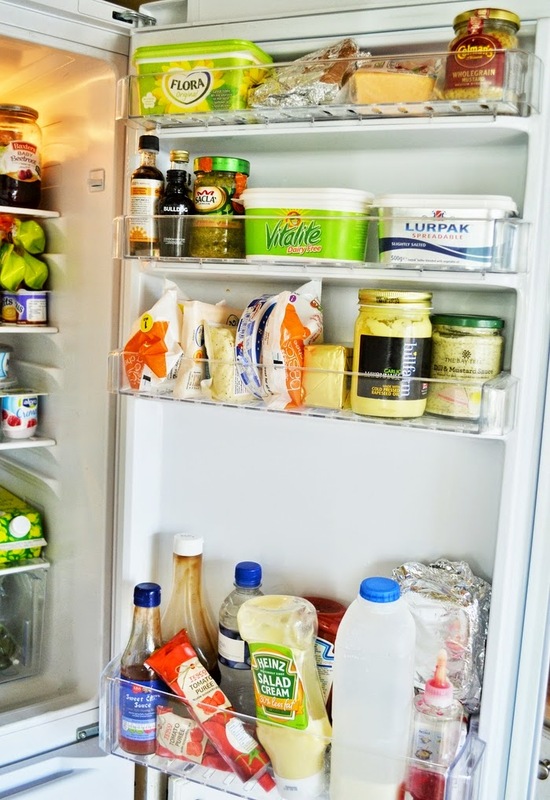 What does your fridge door say about you? 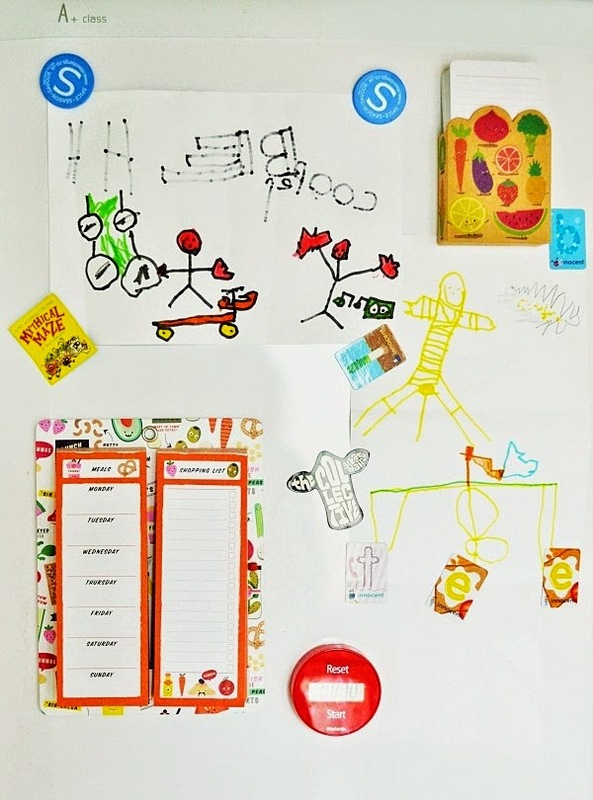 Snap a picture and show us how cool your fridge. Real life shots please. So are you ready to have a look in my fridge? Actually you're lucky. My fridge can get a bit messy, but I tidied it up last week and I've managed to keep it tidy since then. So what do I have in there? Pickled onions, Branston Pickle; Cooks & Co roasted red peppers (my favourite), 2 large tubs of Provamel Coconut Soy Yoghurt, 2 large tubs of Provamel Almond Soy Yoghurt (I had a surprise delivery today along with a box of Zoku pop moulds), a bottle of chocolate sauce, raspberry jam, mixed berry jam, Baxter's Baby Beets (my beets of choice). A carton of orange juice, a carton of mango juice and 2 cartons of apple juice (I juice or blend every day but Graham and Cooper like a glass of plain juice in the morning before they start on my smoothies, I don't know why, but there you go), free range eggs, unsalted butter for baking, puff pastry, a wedge of brie, Activia blood orange and passionfruit yoghurts, petit filous, The Collective suckies (squeezy tubes of yoghurt, nice and natural too. I do love The Collective yoghurts, although these are for Cooper). A big bag of kale for my smoothies, some ripe and ready pears (I have more pears in my fruit bowls, but they take ages to ripen, so I always treat us to some ripe ones we can tuck straight in to), Alpro dairy free yoghurts for Graham and Philadelphia (for bagels or toast). Fresh beetroot, 2 avocados, a head of broccoli, fresh ginger, a bag of fresh mint and one of coriander and another carton of apple juice. These vegetables were in Fresha bags, which I'm experimenting with to see if veg lasts longer (it does seem to), but they are blue so I had to remove them for the photo. Carrots, assorted bell peppers, baby potatoes, courgettes and mushrooms. My fridge door is a bit more of a muddle as you can see. So are you going to enter your fridge? 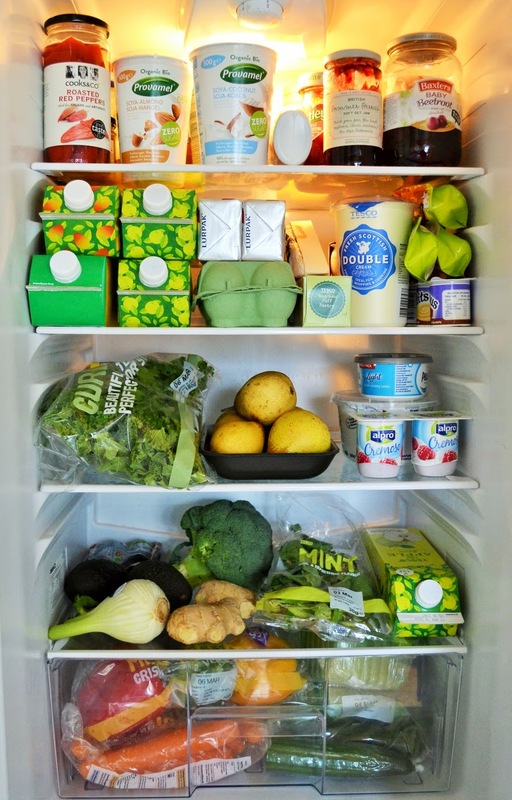 If you're a blogger I double dare you to post the inside of your fridge to let us have a nosey. Let me know if you do and I'll include a link. Go on it'll be fun. In fact I'll add a linky at the bottom. Let's call it Fridge Spy! Link to this challenge in your post and add it to the linky below. I'll keep it up until the end of the month. Now shut the fridge door you're wasting energy! ps That's a tiger in Cooper's drawing. That's his tail hanging down, not a really long willy. I did ask him about it just to make sure! UPDATE: You can check out all the fridges in this post. It's not always this tidy Johanna. Just good timing. I suspect UK only, but do link up to your fridge post. Oh my my, that's ordered chaos! I love it, but at the moment, it's totally the oposite of my fridge. I emptied it to clean it, since it was a bit rusty, but as soon as I get it back on speed, I will fill its tummy with all kinds of delicious stuff! 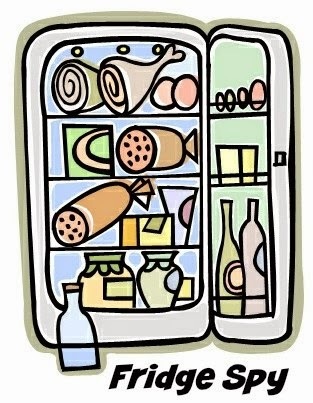 I posted a what's in my fridge a few years back, but nobody replied as I was such a new blogger! Will be more than happy to do it again for Fridge Spy... when I've been shopping, cos it's full of leftovers right now...PS: Love all the veggies you have packed in! Ohhhh your fridge is sooo tidy!!! I love your initiative. I'll try to take a picture of mine this week-end, when the food will be delivered, so far there isn't much to share I am afraid. Yay, That would be great! Ok I've been wanting to do this for ages... get ready! I'm so nosey. I LOVE seeing inside others' fridges (and bookshelves). Thanks for the peek into your veg-tastic fridge! Hehe me too Kate! I think this is going to be fun and if one of us wins a prize too that would be great. Fun post and I love Cooper's contribution ;-). My fridge is currently the most boring one in the world so I won't trouble you with mine, but I will love having a nosey at others'! Awww, I bet the inside is interesting though Kellie. Go on and share it. We are a mosey bunch! Brilliant! I wish I had a fridge to share! I somehow don't think my friends (who we are staying with at the mo) would be all to happy with me blogging their fridge! Hehe, oh well maybe just take a photo of the fridge door and add it to the Homebase comp? Your fridge is really neat compared to mine! It's neat for me too! Long may it last. Hi Fran, no I am talking rubbish. My mum left that it's not dairy free at all, Graham often gets Pure or the dairy free vitalite. I prefer the vitalite, I don't think he minds which he has. Entered the linky and the competition. All the prizes are fantastic! I'll take a pic tomorrow, Jac. Your fridge looks very healthy. YAY!!! At the moment. It will be a lot emptier once I roast vegetables for dinner tonight. Well i thought I should ask. You never quite know with little ones. Oh and the linky is easy. Click on it and you will see step by step instructions. At the moment my fridge seems to be full of yoghurt, tons of peppers and some dips. I need to go shopping so that it would look more like yours. Well Sunday's a good day for it. I need to plan the week ahead & do more shopping.